It was only last August, when I was able to leave my paid job as a computer science lecturer, that I finally got around to asking myself what the truth was about global warming. True, the Kyoto protocol had come and gone (right past me); I had read lots of insults directed at our (Australia's) ex-prime minister John Howard for saying there was no evidence of global warming, and for which he was supposedly a foolish neanderthal hopelessly out of touch with informed opinion. Well was he? I decided to spend some time finding out. I was glad I did, I nearly overlooked an issue that, handled wrongly, might result in billions of human and wildlife deaths. It was maybe by the end of September that I was convinced John Howard was right and his critics wrong. Maybe a week later, I was convinced beyond that, that for sure there was no significant human-caused (anthropogenic) global warming (called AGW for short). That means, of course, that there would be no need for emissions trading schemes (cap and trade, ETS) to try to control carbon dioxide emissions. But when I mentioned my discoveries to some of my friends, almost all raised something called the "precautionary principle", which goes like this: "True, maybe there is no AGW, but if that's wrong, if the world is heating up due to human actions, a disaster will ensue; surely we should introduce ETS anyway, just to be safe; the animals will thank us." I wondered about that. If we want to take a precaution, it stands to reason we should first guard against the greatest danger. But what is that? If it isn't global warming, if, on the other hand, it is global cooling that should worry us, then all the ETSes, "carbon reduction schemes", "reducing our carbon footprint", and so on, will actually make the problem far, far worse. When I was a child, they told me in school that ten or so thousand years ago, the world was in an "ice age", great glaciers covering Europe, Britain, and so on, and now the ice age "is over". One of my biggest surprises when I started researching global warming was that this is very, very wrong: dangerously so in fact. The truth is that the planet is in an ice age, and has been for about 2.5 million years. Temperatures now are maybe eight or more degrees Celsius lower than what was normal for most of the time life has existed. Our climate today is far from normal; it is merely a short warm time in between long periods of frigid, deadly cold. The massive herbivore dinosaurs, eating over a tonne of plant matter every day, roamed a clement land surrounded by warm shallow seas. A lot more than just temperatures come into the equation, of course, but it seems clear that life can tolerate climates much warmer than they are today. On the other hand, it's hard to make a living on a glacier! Ice ages cover huge areas of the planet in ice, and even worse, temperatures are much more variable. According to Ian Plimer in his remarkable book Heaven+Earth, temperatures one year could be up to thirty degrees colder than the year before. I look out the window now at our beautiful Australian magpies, and I don't have to wonder how they would fare if this winter the temperatures dropped 30C: I would be looking through eyes welling with tears for their dead bodies when the ice melted. This data comes from Antarctic ice cores. "Proxies"—measurements that reveal ancient temperatures—from ice going back 400,000 years, show us the shocking truth: the climate has been going up and down like a saw tooth. What's more, the clement warm periods are only brief interruptions to the frigid times that 'knock out' much of the planet as far as supporting life is concerned. Other measures show us that this has happened ever since the current glacial era started a few million years ago. 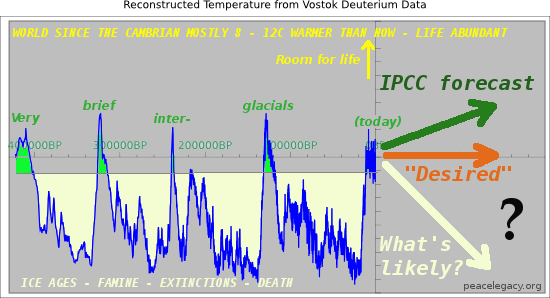 The global warming alarmists tell us that those who don't agree with their scare scenarios are 'climate change deniers'—but who are really the deniers here—the IPCC and its alarmist friends who seem to think that without humans the world would placidly continue in the horizontal direction on the diagram—or the climate realists who say the world's climate has always changed and always will? Let's forget the question of whether the IPCC is right or wrong about the world heating up and about whether humans are causing it. Let's assume they're right 100%. (They're not, but this is about an even bigger question.) Let's say they're right. Now check the diagram. The reason the ice ages come as regular as clockwork is that they are driven by the changes in the Earth's orbit around the sun, its axial inclination, and so on, things that change slowly over many thousands of years. 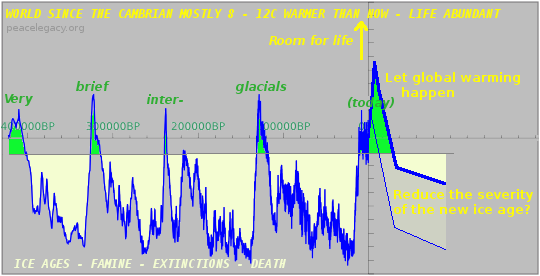 Currently the ice ages are responding to all this on a 100,000-year cycle, and it is crystal clear that the next major movement on this cycle will be down, a sharp plunge into glacial conditions, followed by 100,000 years of a slowly deepening, ever-more deadly freeze. So now we come to the precautionary principle. What's the bigger danger? If the planet heats we might unfreeze some polar regions (cold regions heat more than hot regions) and make Siberia, northern Canada, and Greenland into green, verdant places where crops can grow and wild animals can prosper. Yes, we might also have to relocate some people if sea levels rise; we can't pretend there is no downside at all from a warmer planet. But if the planet cools, what then? Half the northern hemisphere landmass will be uninhabitable (and much of the southern hemisphere too). Climates will alternate viciously from year to year; no animal that is unable to migrate will be safe. The wealthy populations of Europe and North America, whose countries will be covered in ice, will obviously not simply sit down and die; they'll migrate south and take the remaining warm places for themselves. Whatever the outcome, there will be wars, starvation, and unthinkable human and wildlife deaths. If we escape without half the world's population dying, we'll be very, very lucky indeed. So here's my vision of a wise precautionary principle: take advantage of any heating that human activity is making happen. If industrial activity is pumping up the planet's temperature some degrees, excellent. The IPCC says we are making big changes, but climate realists, more credibly, say we are making only small changes. But big or small, any warming we can organise will forestall the next ice age. By lots (the alarmists) or only a little (climate realists), it all helps. It would be bad enough if the alarmists misused the precautionary principle merely to impoverish people with mad 'carbon reduction' laws. But shockingly, the alarmists are not stopping at wrecking our economies with nutty schemes. Many of them want to put cold-generating sulphur pollution into the atmosphere, or seed the oceans with iron or, even worse, lime, or any number of other hare-brained schemes designed to cool the Earth. Can anything be less like a sensible precaution than that?